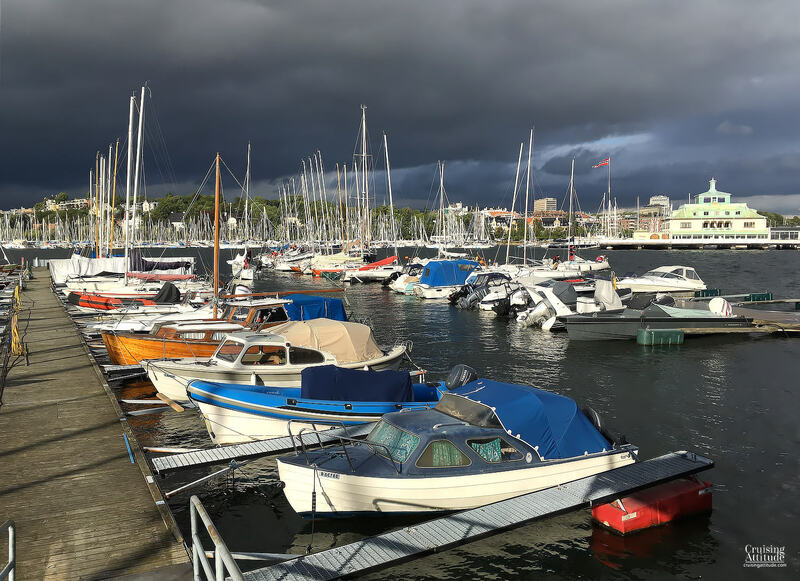 The Oslo Boat show was winding down when we arrived in the Oslo area, which meant that the Aker Brygge marina was still closed to the public. We decided to stay in one of the lovely anchorages not far from the city. 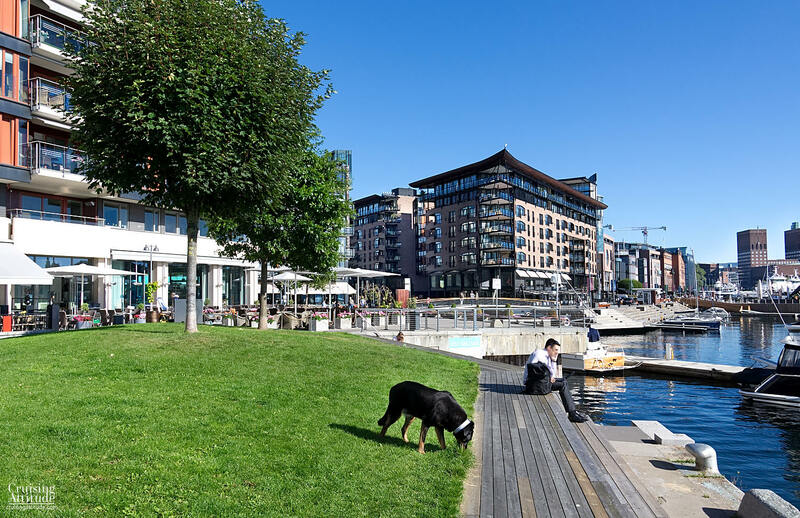 The Ostøya-Grimsøya-Kjeholmen group of islands is only about 6 nautical miles from Aker Brygge in Oslo and outside of the “high” season in the middle of summer, it’s not crowded at all. Several houses dot these islands so lying at anchor is the best solution so as not to disturb the inhabitants. 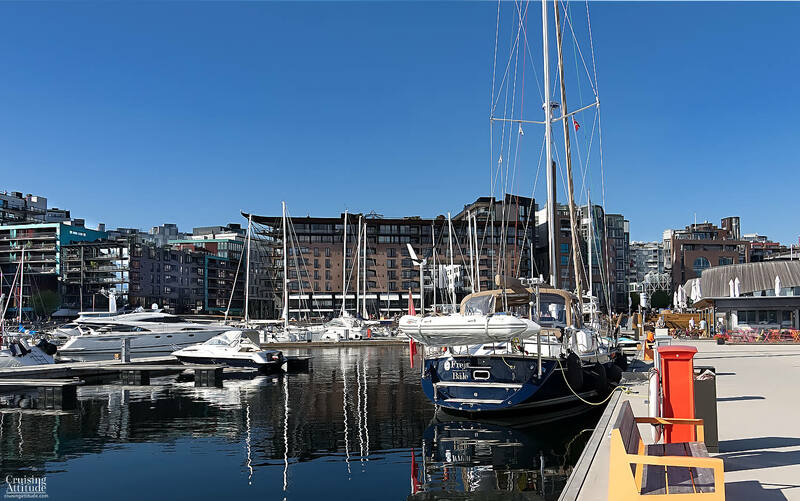 The Aker Brygge marina had announced on their website that it would open to the public on the Tuesday after the boat show, so we left the anchorage for Oslo city. Surprise! The workers who were taking down the tents and temporary pontoons were not yet finished with their task. We were given the choice of lying on the outside of the pontoons or finding another marina. The wind was brisk and coming straight into the marina making the waves in the entire harbour quite choppy. We clearly did not want to moor on the outside of the marina. 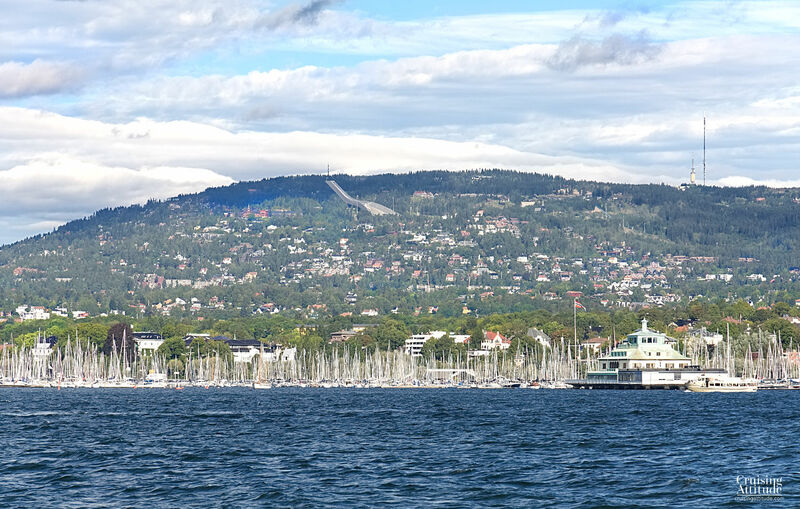 The ferries and cruise lines that enter and exit Oslo also create a lot of waves. We opted to go to Dronninghavna. 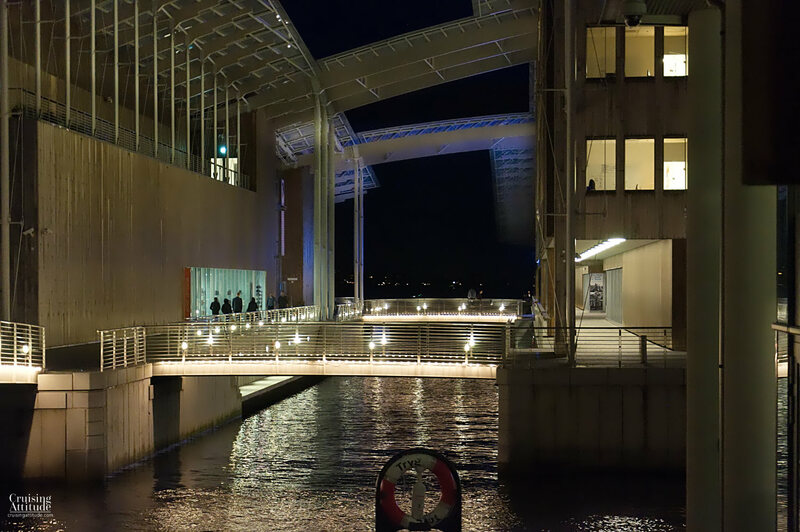 The Dronninghavna is otherwise a good choice for those of you who want to visit the most famous of all of the Oslo museums: the Viking Ship Museum, the Kontiki Museum, the Fram museum and the Norwegian Folk Museum. They are all on the same island as the marina, Bygdøy. 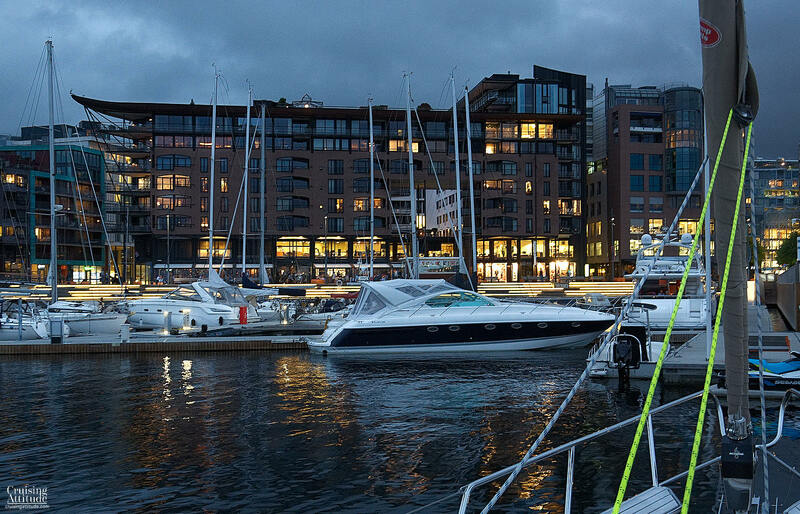 Finally, on the Wednesday after the boat show, we were permitted to up at the Aker Brygge marina. 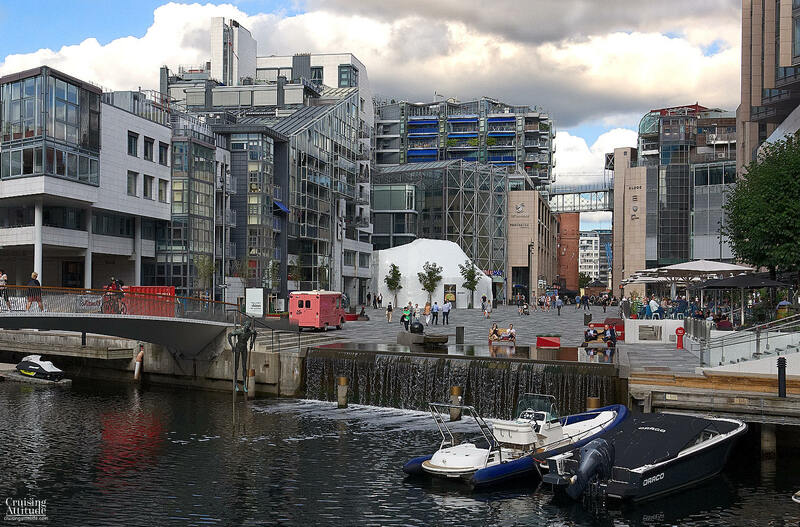 This is the marina closest to the city centre of Oslo. 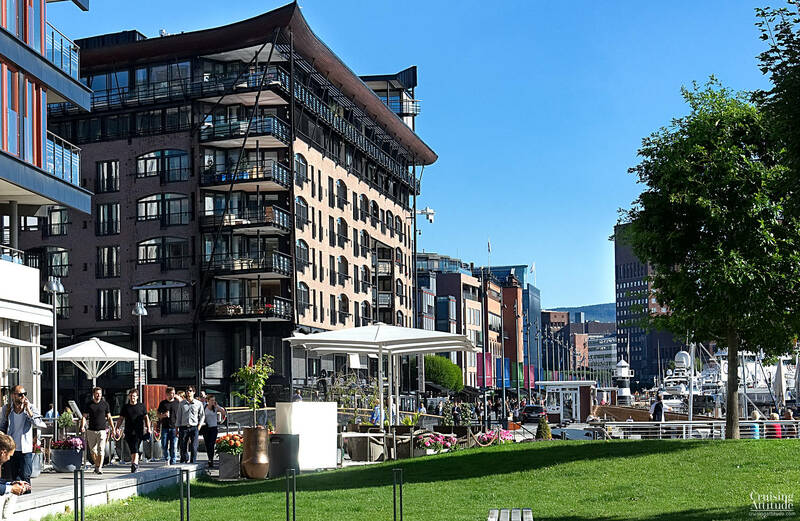 Aker Brygge is a modern waterfront neighbourhood that successfully blends restaurants, cafés, boutiques, offices and living space. For anyone who loves modern architecture, this place is just amazing! The marina is relatively new and you’ll find everything you need, including toilets and showers, a laundry room, wifi, and a small café. The toilets, showers and laundry room were all spotless and in brand new condition. We absolutely loved staying here! 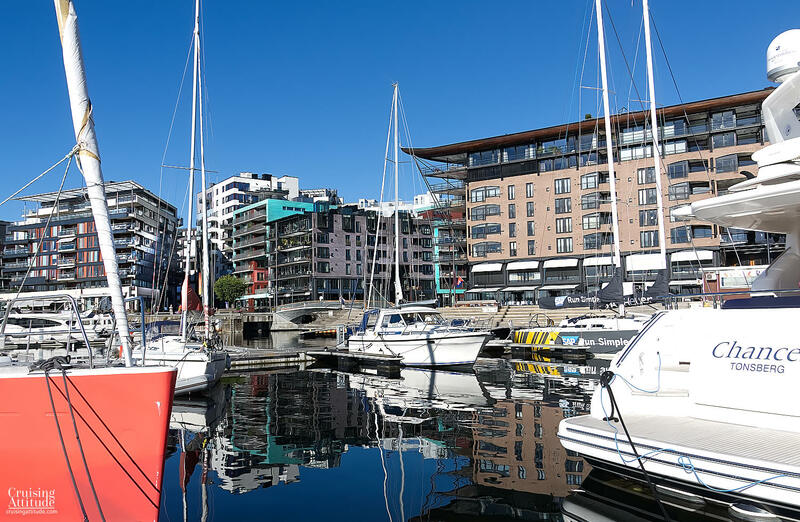 It’s relatively expensive, but you get a pristine marina and walking distance to downtown Oslo for the price. The only downside is that it can get quite noisy if the weather is nice and there are lots of people out. Marina Prices: 14 NOK per foot. This includes WiFi, use of toilets, showers, washers and dryers, electricity and water. 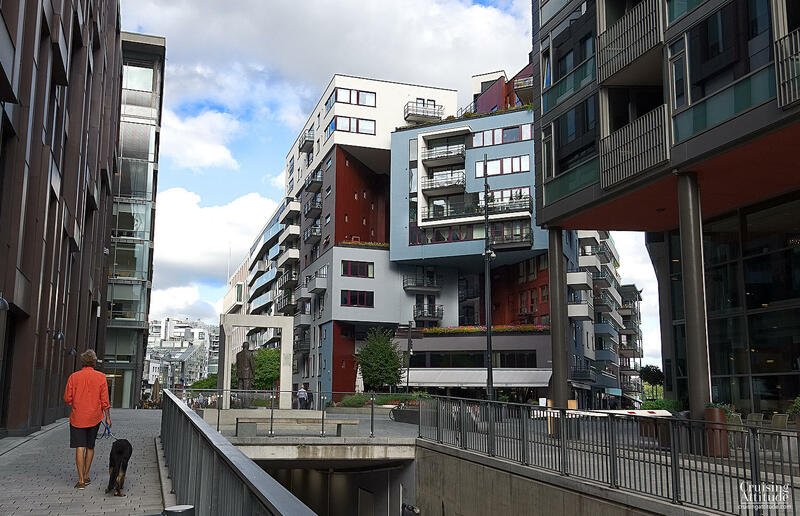 The Aker Brygge/Tjuvholmen area was built from land that served as a shipyard and small mechanical factories until 1982. It was then developed, step by step, into the amazing architectural wonderland that it is today. A few of the buildings were not removed, but renovated and reborn as shops, offices, restaurants and apartments. 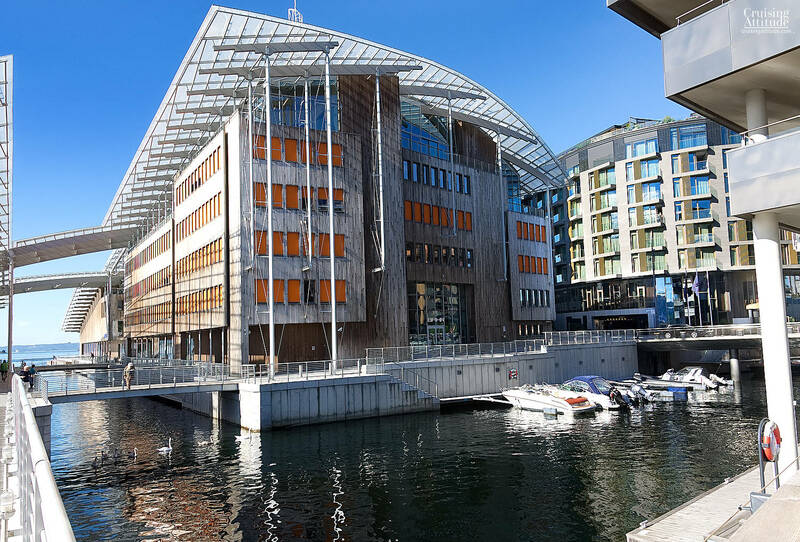 Some of the more well-known architects represented here include Niels Torp (who also designed the beautiful SAS building outside Stockholm), Space Group and Renzo Piano, who designed the Astrup Fearnley Museum on Tjuvholmen. 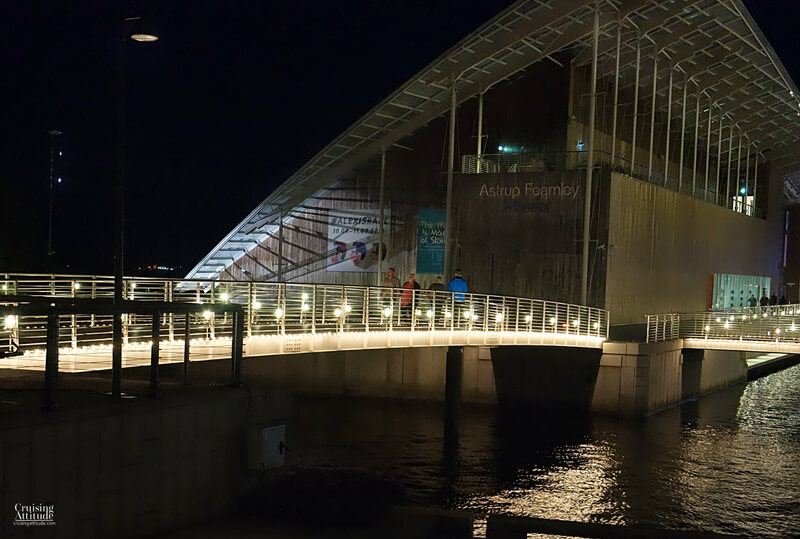 Renzo Piano is also the architect responsible for the Shard in London, the Paul Klee Centre in Bern, Switzerland and the New York Times building in New York. 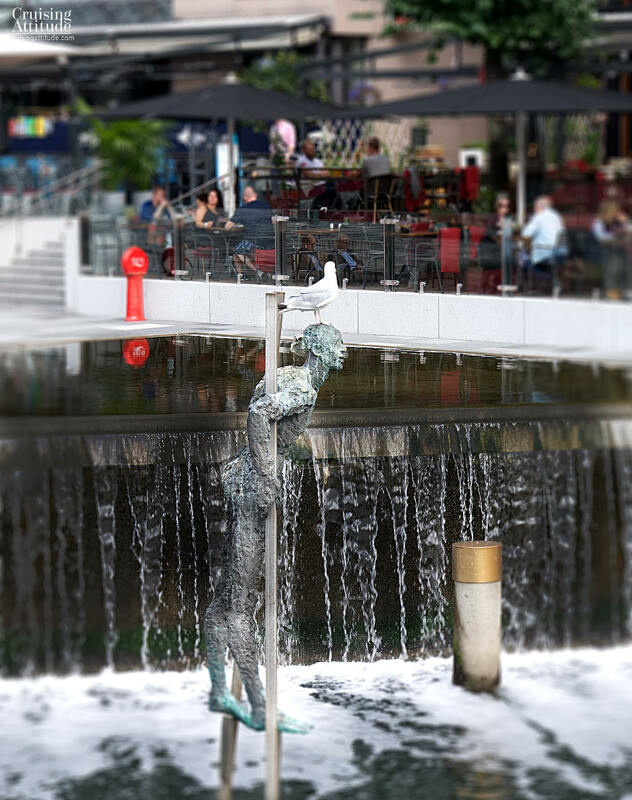 If you are passionate about architecture as an art form, you will love this area. 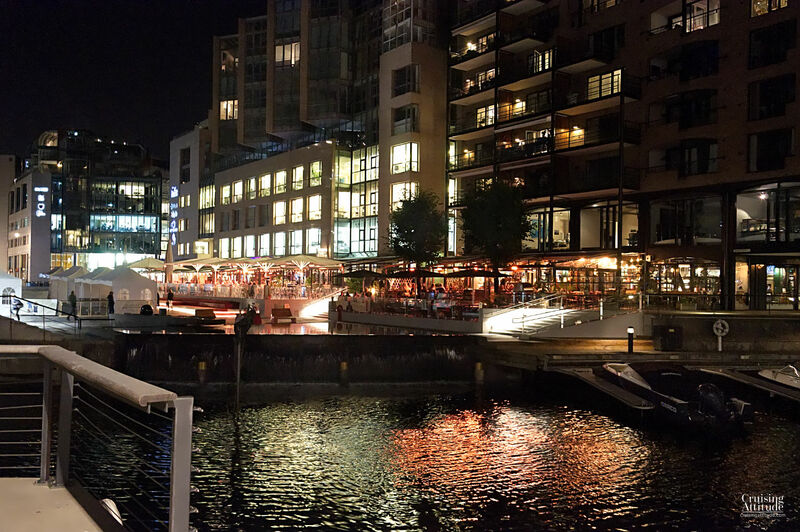 The Aker Brygge is the part of this new area with the most restaurants, shops, bars and cafés. We had dinners or lunches here and found what we think are Europe’s best croissants for breakfast (it’s the incredible Norwegian butter)! You’ll find lots of different shops and boutiques, but for essentials, there is the Coop grocery store. You can get your internet access card for your router at Telia. 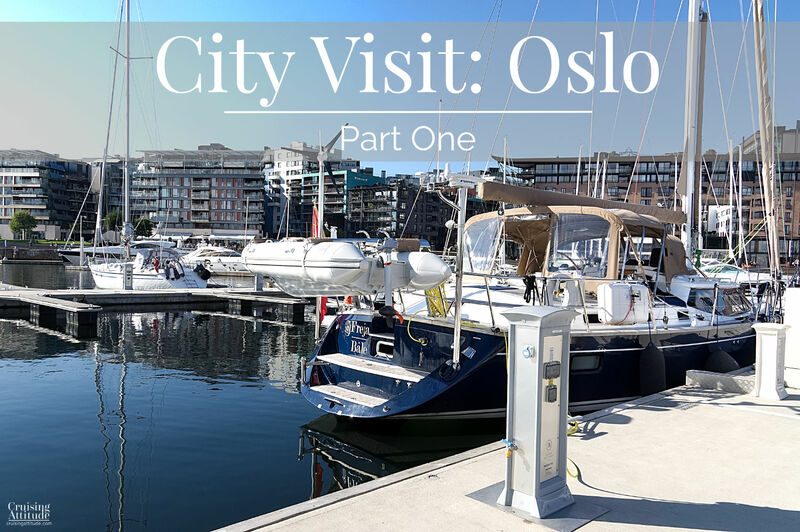 In my next post, I’ll go over our favourite places to visit in and around Oslo. 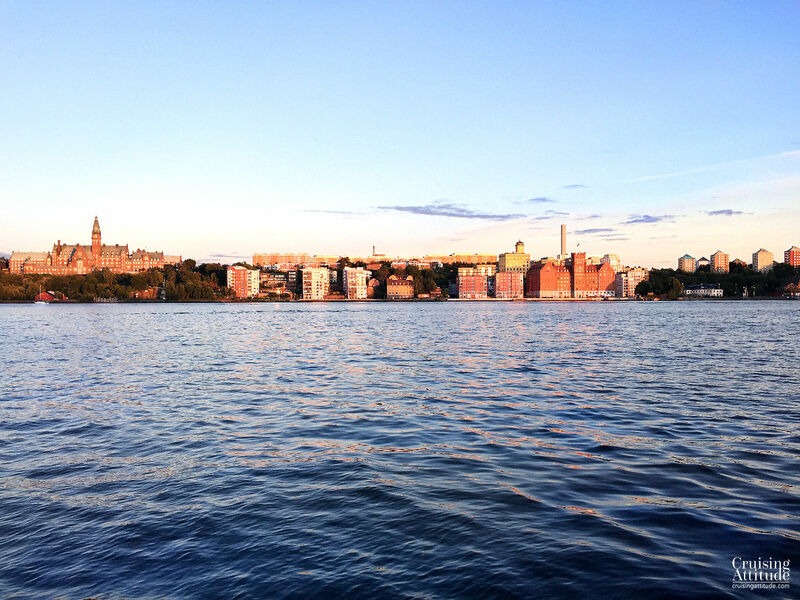 The city of Stockholm is situated between the sea and a large lake called Mälaren. 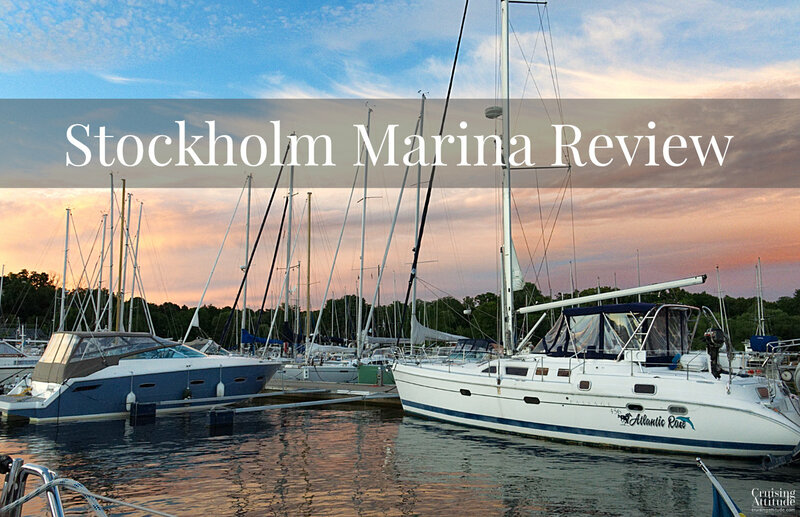 You’ll find two marinas for visiting boats on the sea side: the Navishamn, which is actually a boat club marina, and the Wasahamn marina. We stayed at the Navishamn. 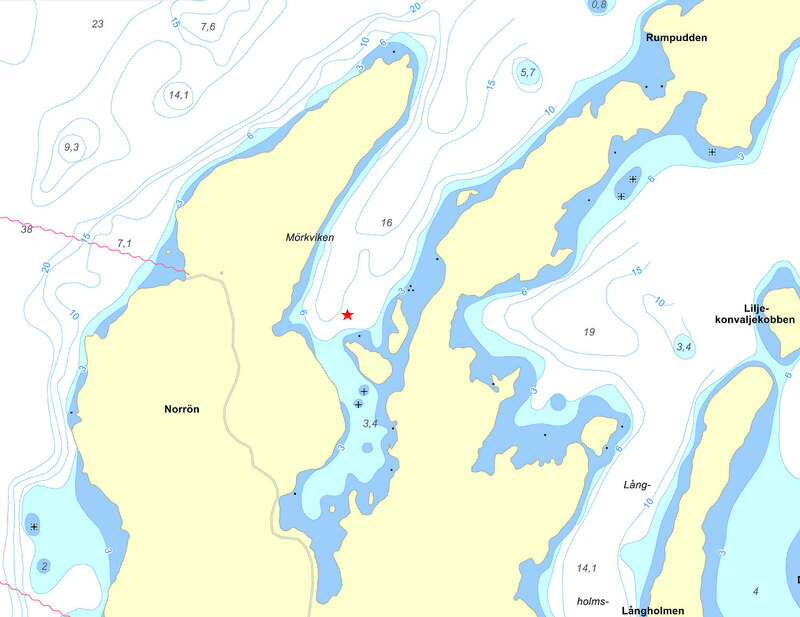 The island of Djurgården (on the right side of the map) and its two guest marinas (red stars). Ferries leave from Djurgårdstaden to take you directly to the Old Town (Gamla Stan). Otherwise, the tram route (S) takes you right into town. 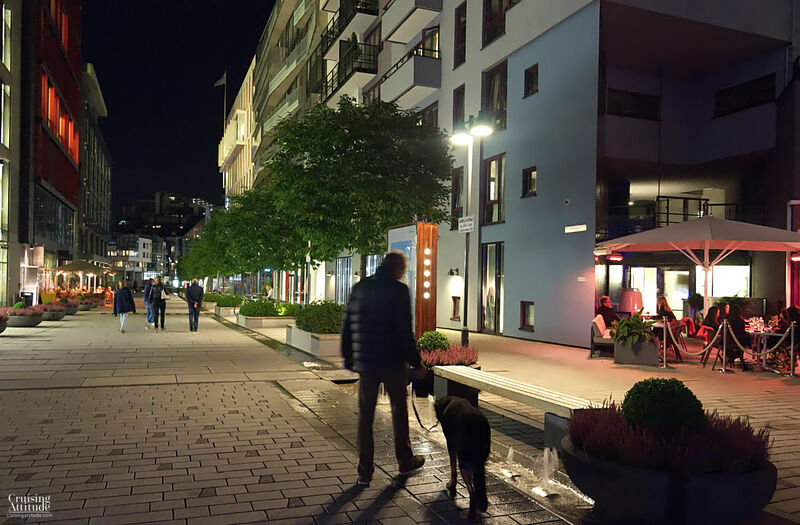 The reason we chose the Navishamn is that we are willing to give up some convenience in terms of closeness to the main parts of the city in exchange for more peace and quiet. A distance of about 1.5 km separate the two marinas. 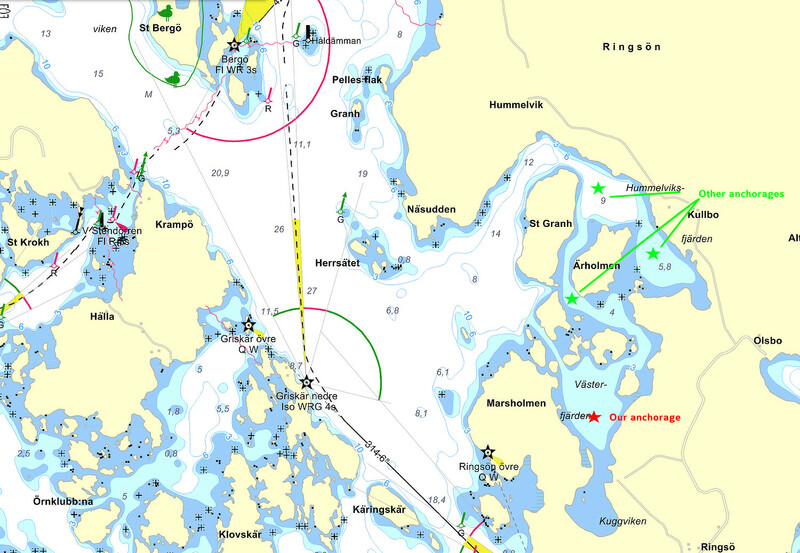 The Navishamn is actually the marina for a club called the Navigationssällskapet (Navigation society). 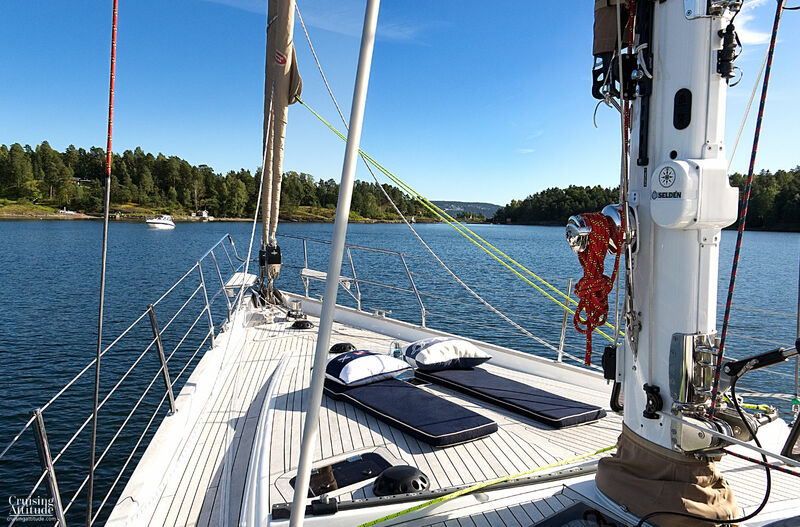 Guest berths become available when members leave their permanent berths to go out sailing or to occupy a summer berth further out in the archipelago. Their berths are then rented out to visiting boats. You can mail or call ahead to reserve a berth. 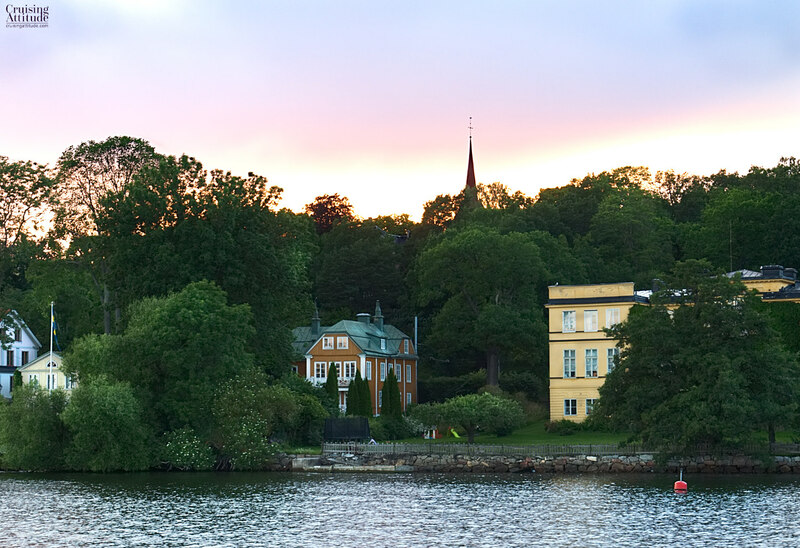 The marina is located next to a small palace called Prins Eugens Waldemarsudde. Prince Eugen (1865–1947) was an artist, specialising in landscape painting. The palace showcases not just his amazing body of work; it presents temporary exhibitions of other artists as well. Upcoming exhibitions in 2017 include Joan Miró and Carl Larsson. It’s a must-visit if you are a fan of landscape painting. 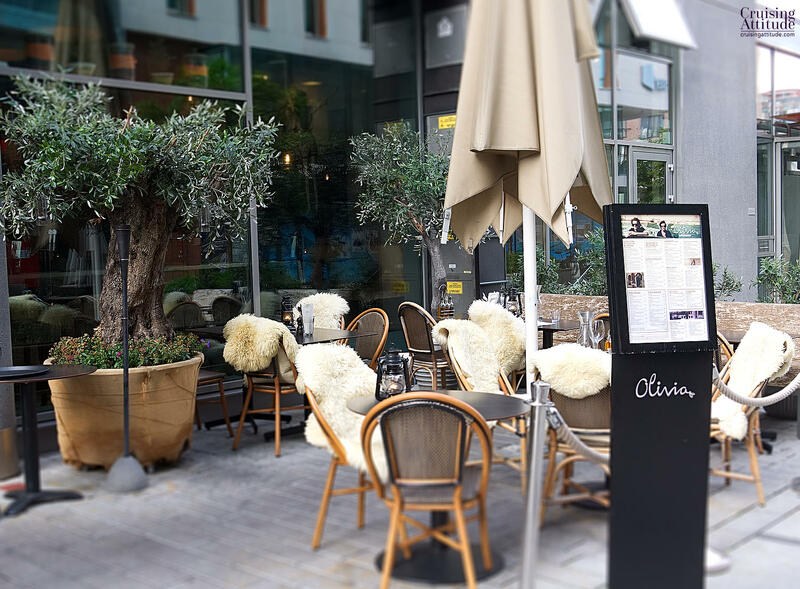 It’s a 5-minute walk from the marina. The gardens around the palace are free to visit and they are worth a visit for anyone interested in landscaping/ gardening and sculptures. 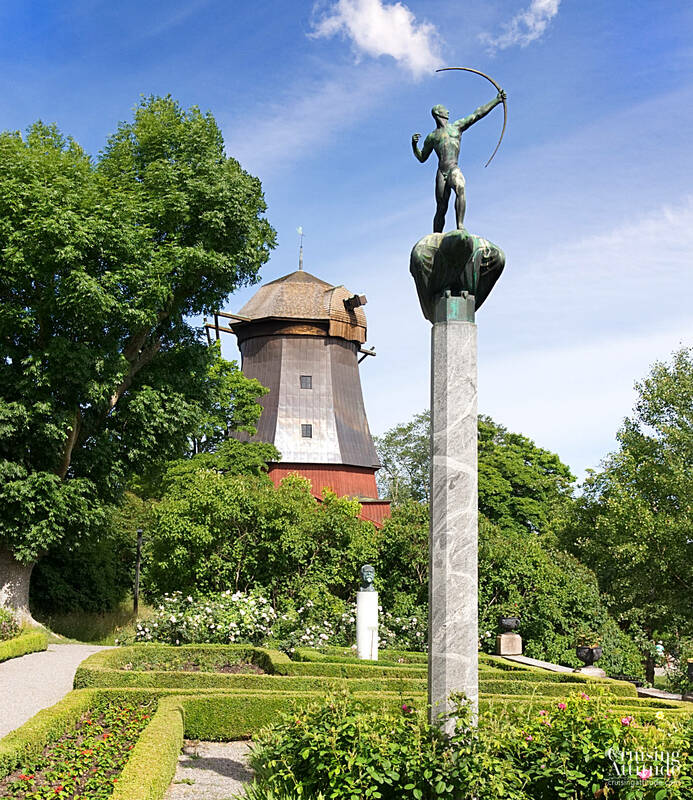 There are quite a few famous sculptures spread around the gardens, including those of August Rodin and Carl Milles. The old stables of the palace. You can sit here and look out over the water and the traffic going to and from Stockholm. We walked through the gardens and the forest next to the palace every morning and evening with Senna. The path continues for several kilometres around the island if you enjoy long walks. Senna is always up for a swim! 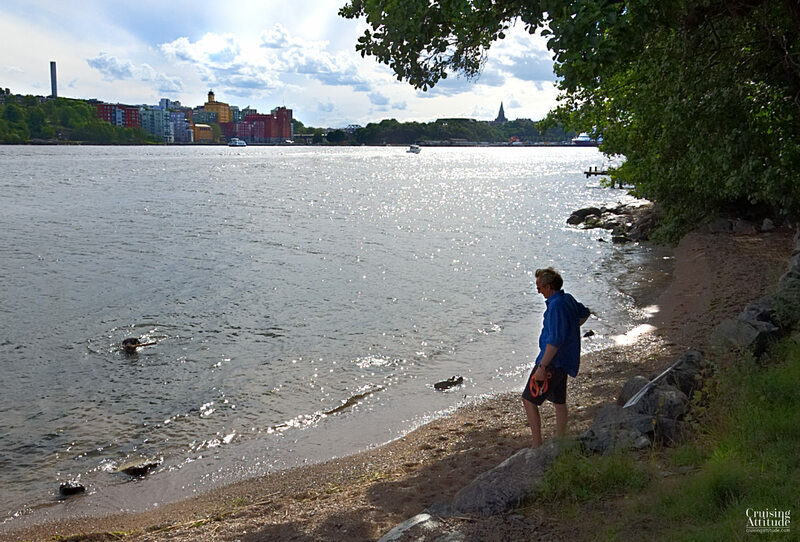 This little “beach” is about a 15-minute walk from the Navishamn, just after the Palace of Waldemarsudde. 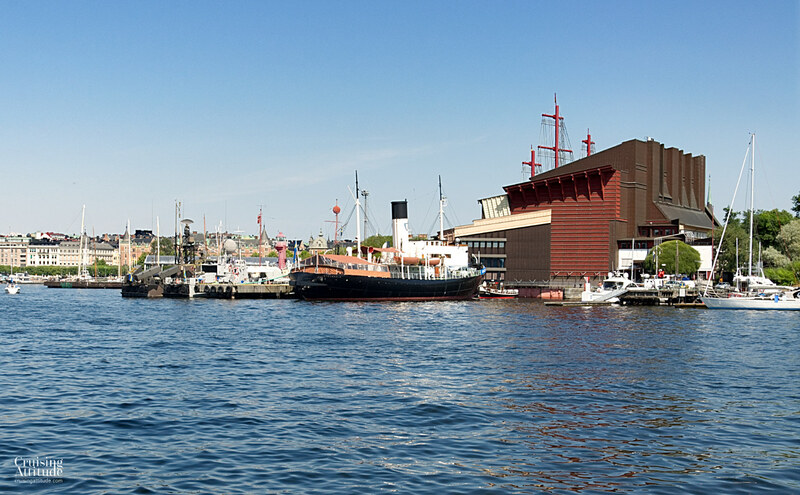 The Wasa Museum (the Wasa was a warship built in the early 1600s. It capsized during its maiden voyage, was recuperated in the 1950’s, meticulously restored and then housed in its own museum for all to look upon with wonder). The electricity is only 10A. 16 would have been better for us. The toilets and showers, although clean and in proper working order, could use a renovation. Jacques is replacing the USB hub for our Furuno chart plotter remote. The hub suddenly stopped working. Lovely view from the cockpit! Fiery colours of sunset reflected in the buildings across the water from the marina. Number of berths: up to 175. Berthing method: bow or stern to quay, buoy (are usually far enough away for a boat up to 55-60 feet.) A few alongside berths on the outside that are for very large or heavy boats only. 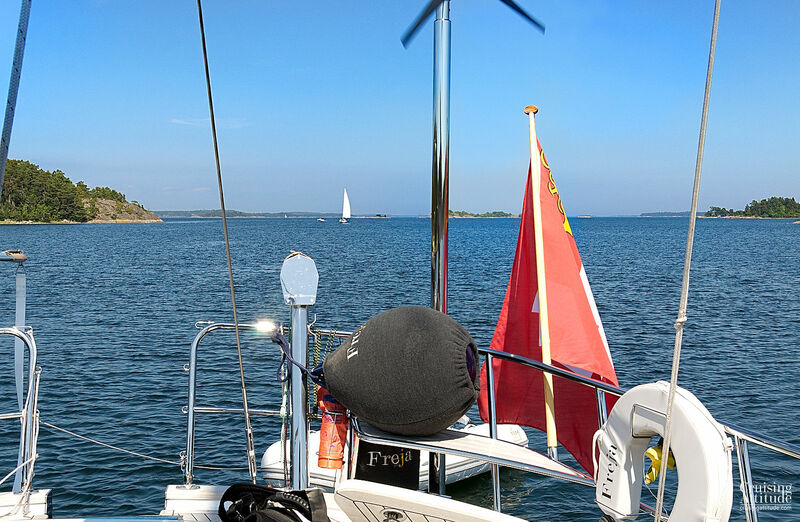 Facilities: toilets, showers laundry, electricity (10A), fresh water, free wifi (although if your berth is far from the office, you’ll need a wifi booster to get the signal) air pump for your fenders(! ), berths for large boats up to 25 meters and 50 tonnes. Electricity costs 50 SEK per night. 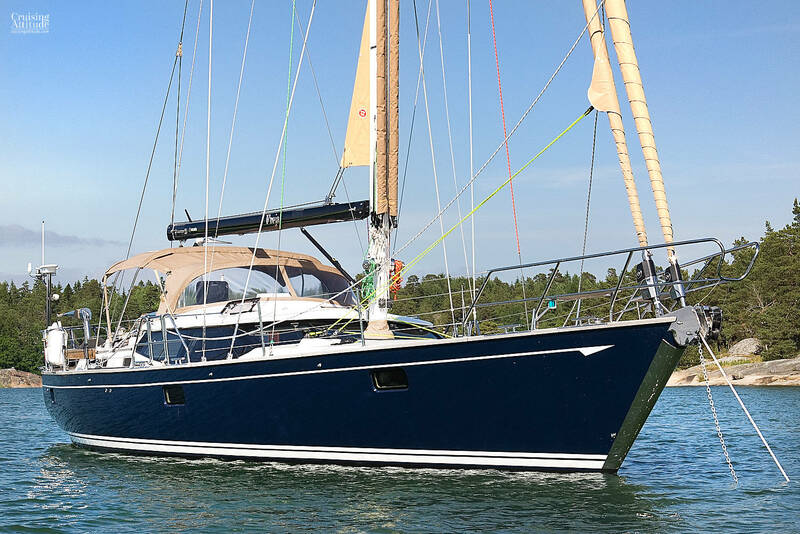 Open from 1st of May until end of September Contact info: email: hamnkapten@navis.se, phone: +46 70 732 34 41, Harbour office hours: 8.00–20.00 (during high season). 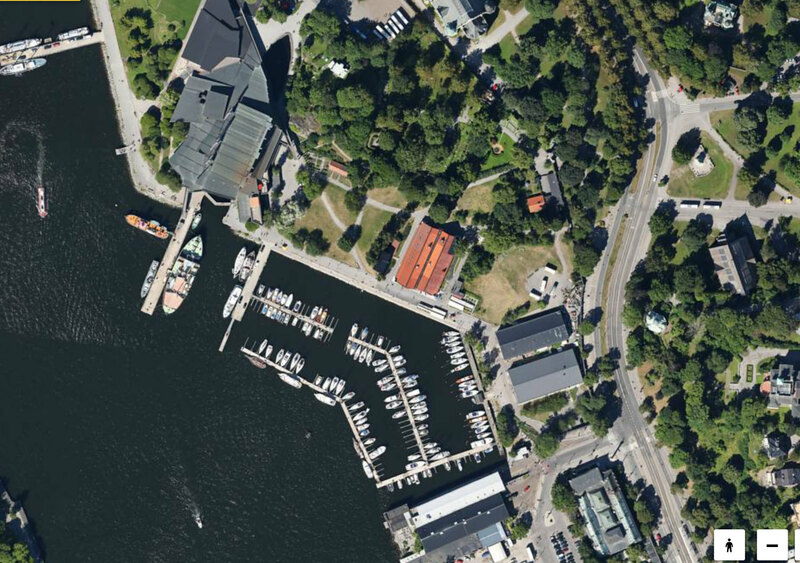 Google Earth photo of Navishamn marina and the surrounding area. The Wasahamn is located next to the Wasa Museum. 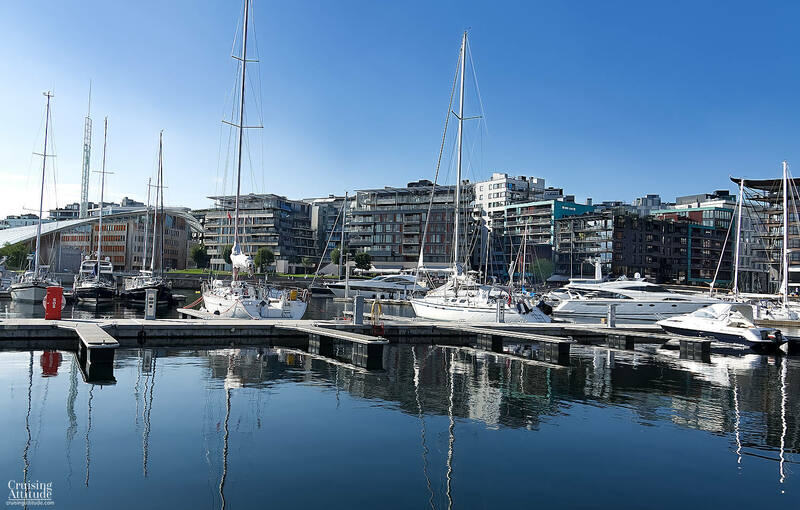 It is a private marina that functions as a guest harbour and has 146 berths. 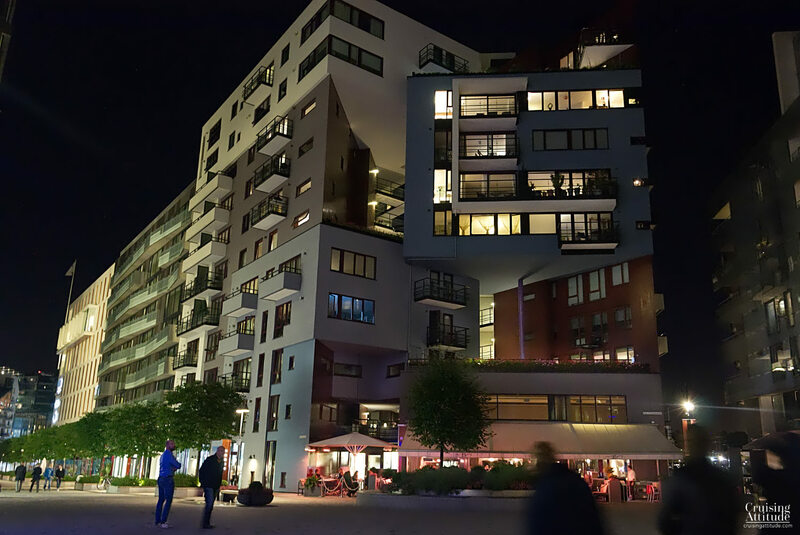 The advantage of the Wasahamn over the Navishamn is its proximity to a large number of tourist attractions and restaurants. They are a stone’s through away from the marina gates. 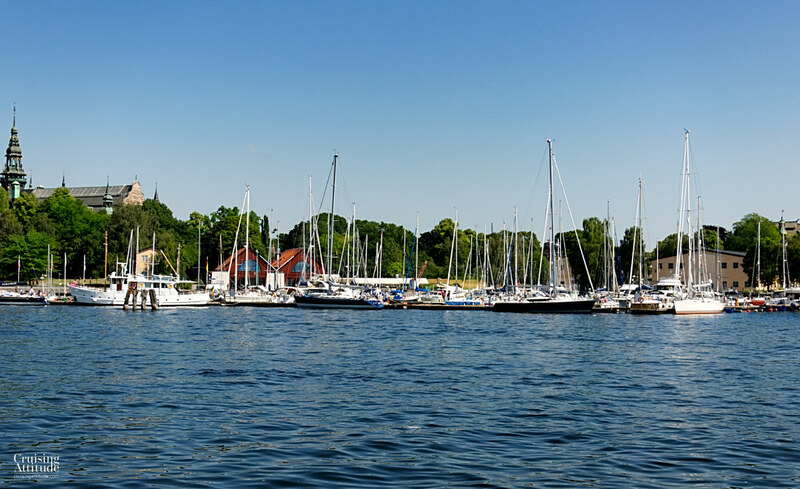 The Wasahamn marina on Djurgården. The tower you see on the left is the Nordic Museum. The 2 red buildings on the left make up the museum of Wine and Spirits. This does come at a price, though. 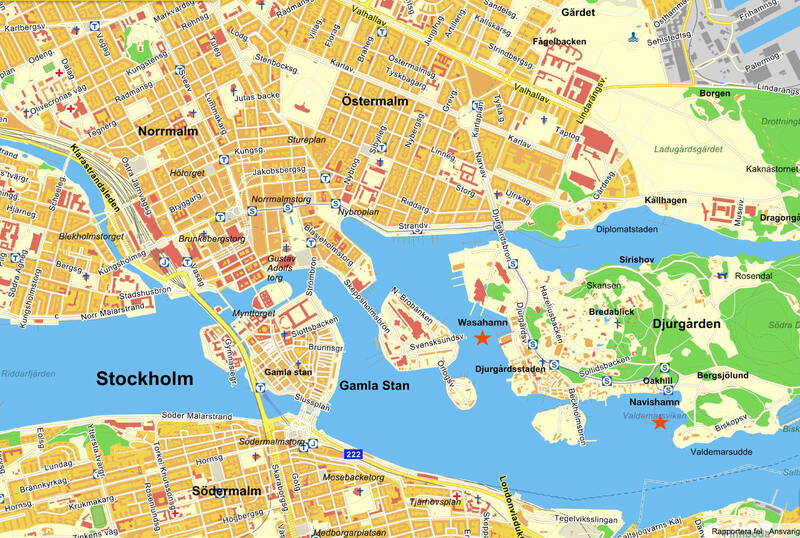 The noise level here is much higher, especially the noise coming from Gröna Lund or Skansen, where regular concerts are held. Thankfully, the concerts usually end by around 22.30, so you will be able to get your sleep. But forget about having a peaceful evening meal in your cockpit. Here you see that the marina is right next to the Wasa Museum. 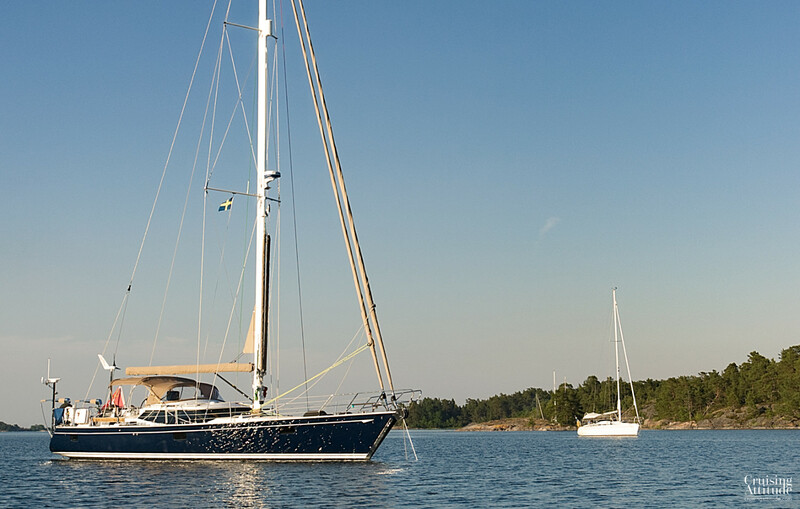 After spending a day at the marina in Oxelösund, we were once again northbound for the Stockholm Archipelago. 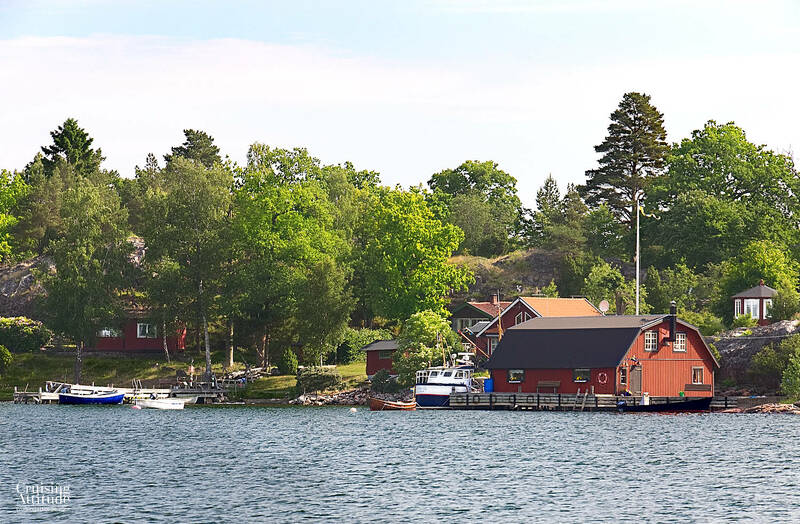 But before I get into the anchorages, I’d like to provide a short review of one of the two marinas in Oxelösund, because it’s a good stop for provisioning if you want to spend the next week or so at anchor. Oxelösund is the home of a big steel works, so it’s not exactly the most beautiful place you’ll see in Sweden. There isn’t any smoke pouring from smoke stacks, so the air is clean — it’s just not a very pretty site. Sailing past Gamla Oxelösund (Old Oxelösund). Fisherman’s cottage. 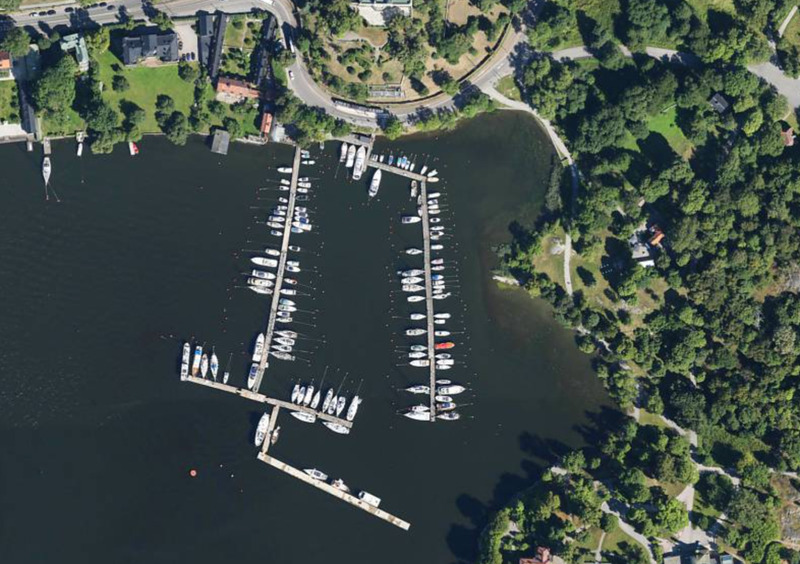 You can chose between two marinas in Oxelösund. 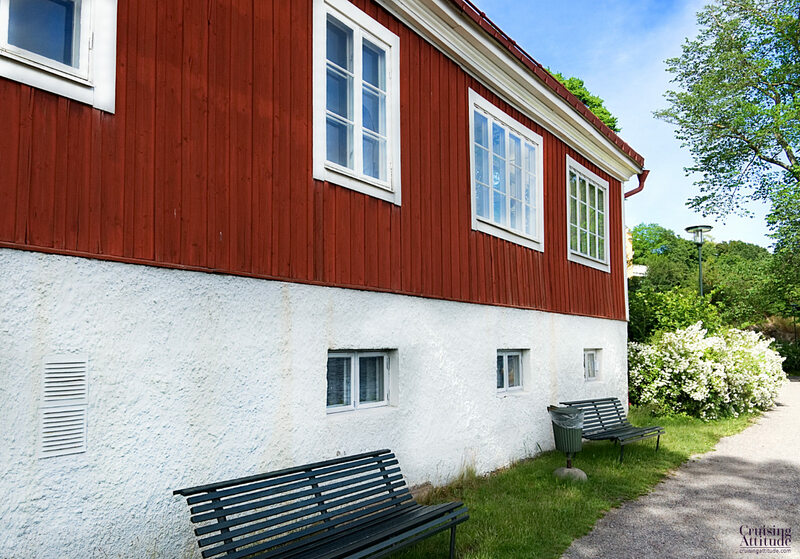 We stayed at “Oxelösunds Gästhamn” – it’s the closest one to the center of the small town – about a 15 minute walk. 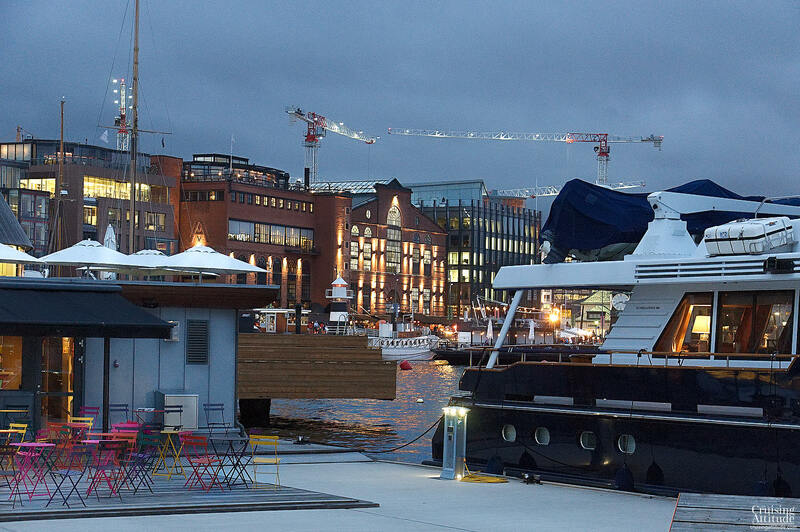 The other one is the Femöre marina. It’s farther away from town but has the advantage of having a restaurant right at the marina. Sorry about the lack of photos, but it was raining hard while we were there! 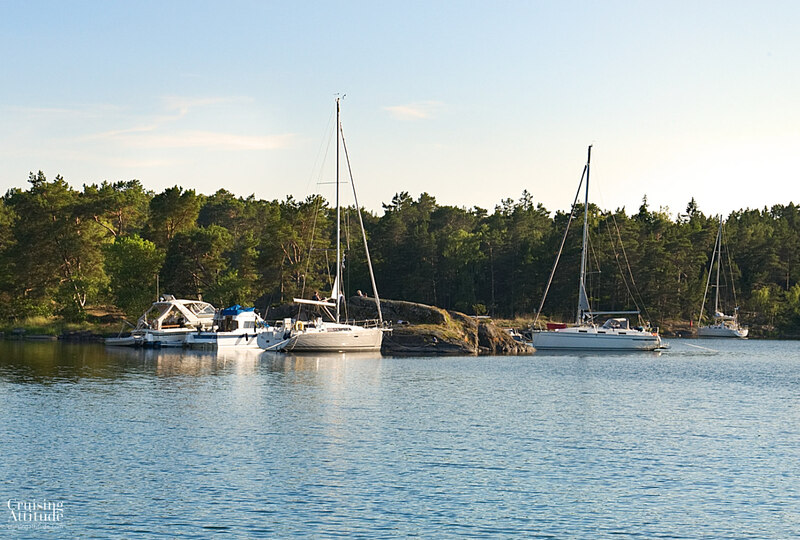 The Oxelösund marina provides great service! We were met at arrival by a young man who showed us the best place to come alongside and took our lines. 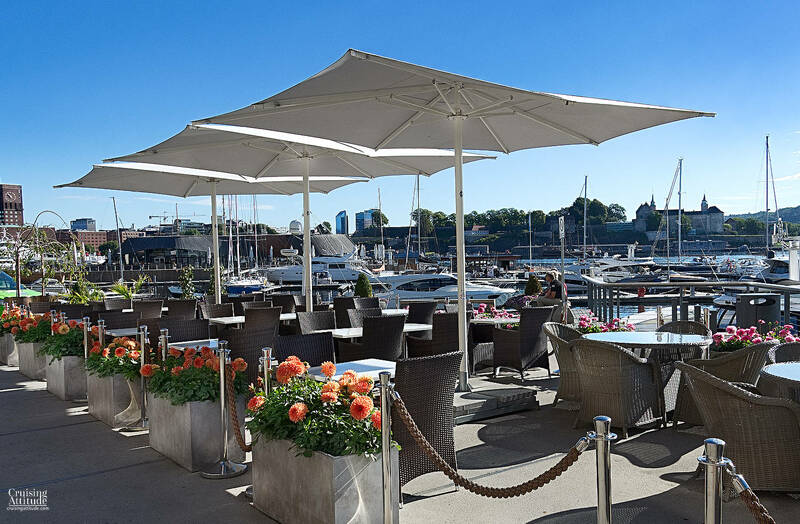 Although the marina doesn’t have a restaurant, it does have a small café that serves cold and hot drinks, snacks and — ice cream! All of the staff were kind and very helpful. The large ICA Kvantum supermarket in town has just about everything you’d need to provision, and it’s open from 8.00-21.00 every day. For those who hate to cook, there’s a good choice of ready-to-eat or -heat selections from the deli counter. It was still Swedish strawberry season, so we loaded up on some (a lot!) from a local organic grower. Facilities: Toilets, showers, sauna, washing machines and dryers, microwave oven, free WiFi, fresh water, electricity (50 SEK per day), bicycle and kayak rentals, play area for children, basketball and boules areas, black tank pump-out self-service dock, fuel dock, snack bar with outdoor seating. The small town hosts shops and museums as well as a children’s “adventure land” called Boda Borg. Telephone: +46 70 600 1105. If you phone just before arrival, someone will come to help you dock. 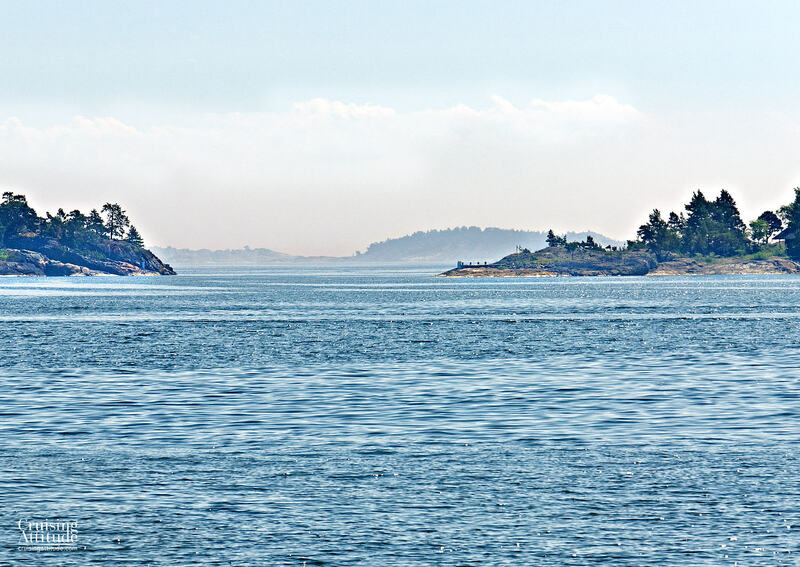 The routing from Oxelösund to Ringsön takes you through a fabulous part of the east coast archipelago chain. Be sure to pass through the “Stendörren” (stone door) on your way to Ringsön. 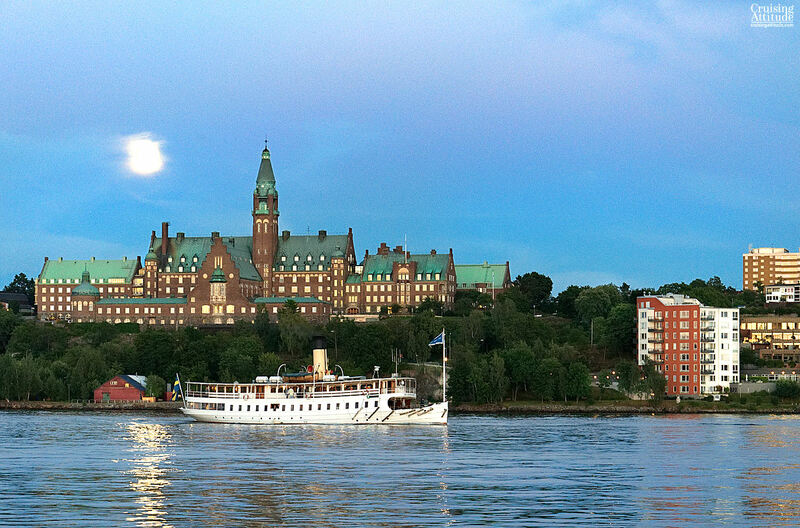 It’s amazingly beautiful and it’s appreciated by all Swedish sailors who pass through. Approaching Stendörren (the Stone Door) passage. Going through the Stendörren (the Stone Door) passage. We discovered Ringsön with our friend and coach, Leon Schultz back in 2015. It’s a huge anchorage providing shelter from all winds. Th approach to Ringsön via Stendörren. 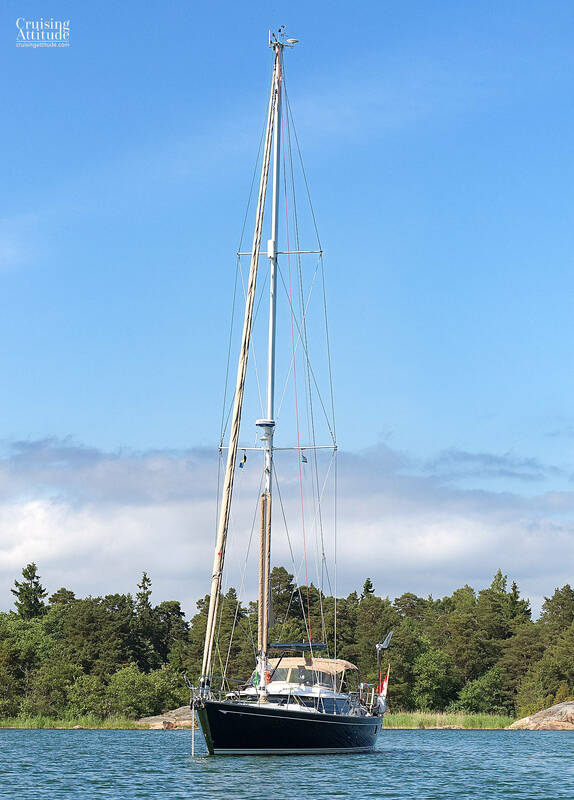 At anchor in the southern part of Ringsön. The nature at this anchorage is exquisite, seemingly untouched by man. We had a short swim, but the water was still rather cool at 18°C. The weather had cleared up considerably. 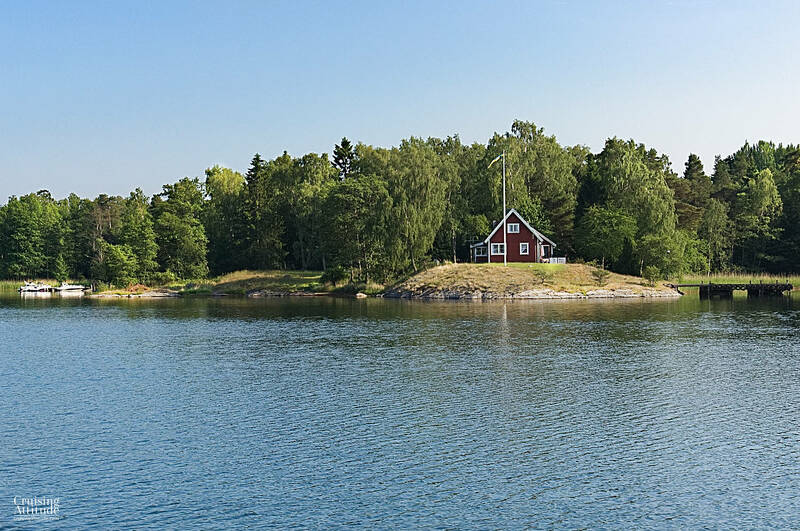 The route from Ringsön to Rånö takes you past the Landsort lighthouse, one of the most famous ones in Sweden. 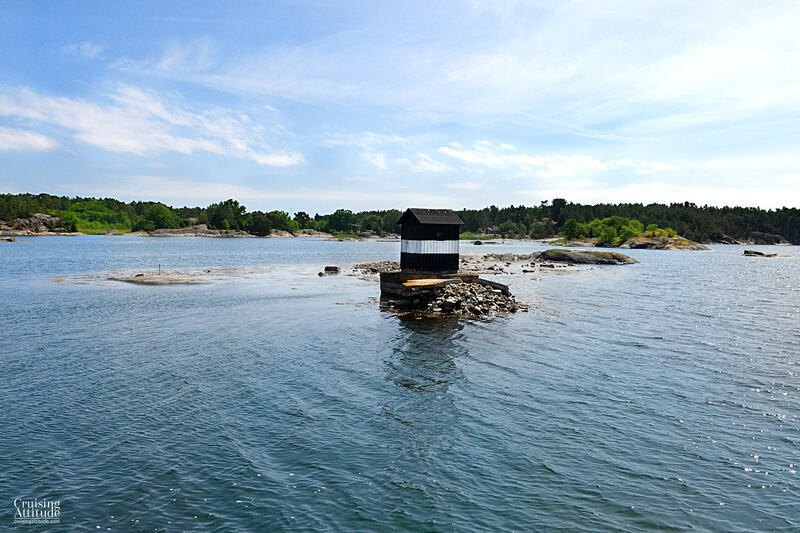 It also marks the southern limit of the Stockholm archipelago. 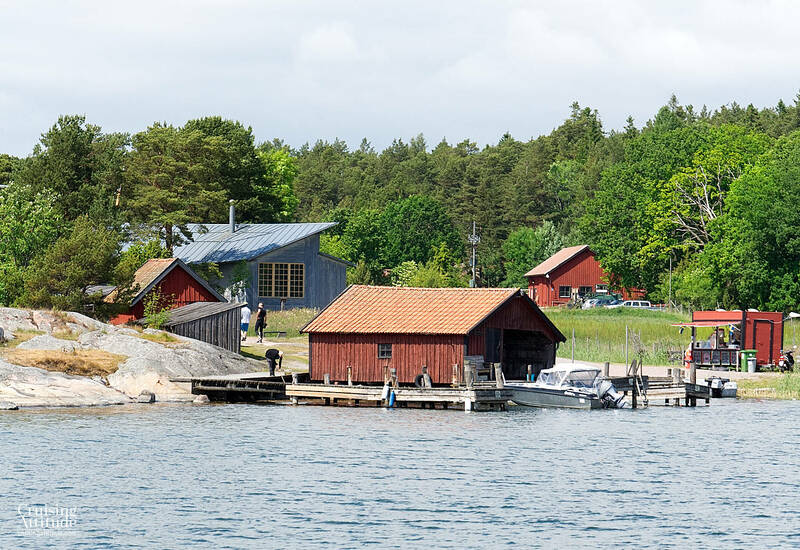 You’ll also notice more summer cottages and fishing cabins on the islands, as we are now getting closer to Stockholm. 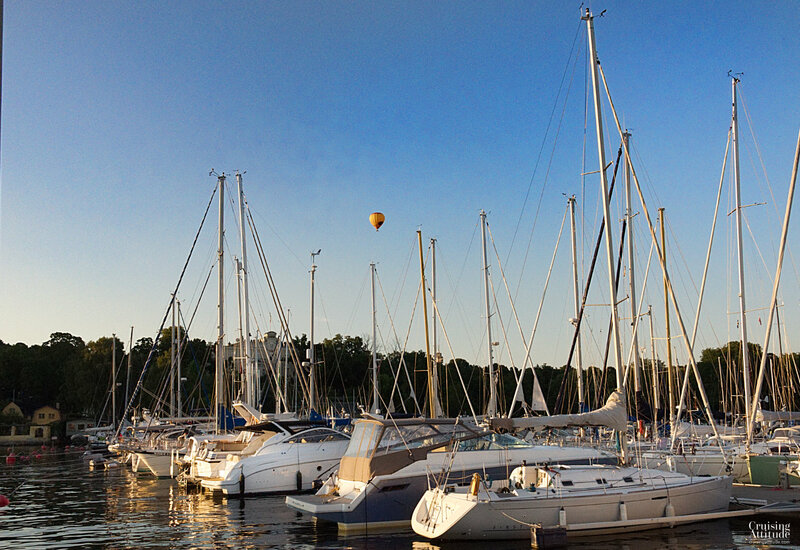 The inner route takes you past Nynäshamn, a medium-sized town know for its huge ferries to both Gotland and Latvia. The marina is right next to the ferry terminal. If you didn’t stop in Oxelösund to provision, you can do so in Nynäshamn, which is a bigger town with a greater choice of shops. 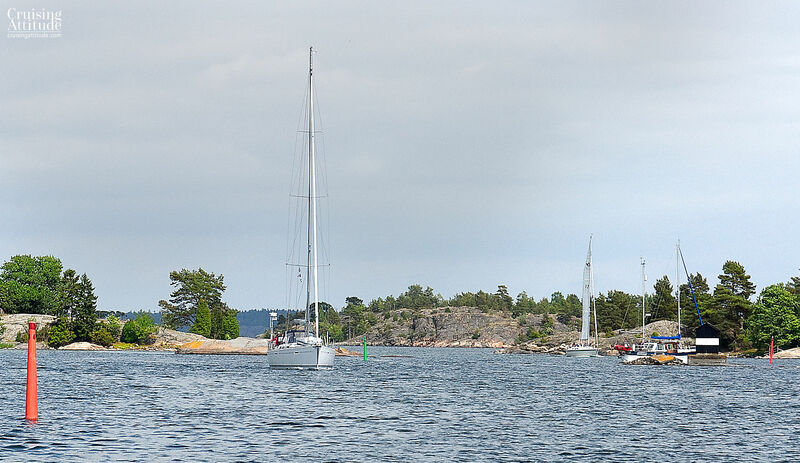 We actually tried to anchor up at the island of Nåtterö, famous around Stockholm for its sandy beaches. We tried five times to get our anchor to hold in the cove called Östermarsfladden. To no avail – there was just too much thick seaweed growth on the bottom. Each time, it seemed to hold, but as soon as we got to around 1,600 rpm during our backing down process, we started to drag. Since we’re not happy until it holds at 2,200-2,500 rpm, out we went! 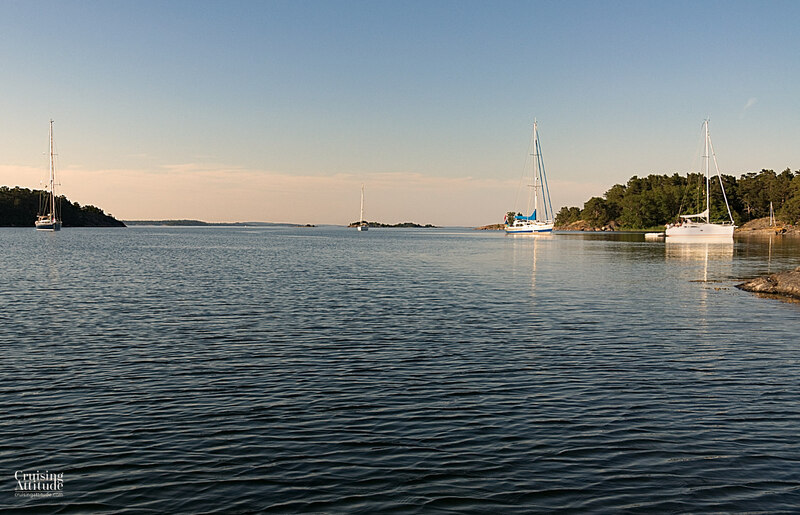 We saw on the charts that Rånö seemed to have a well-sheltered bay called Rånöhamn. It’s sheltered because the entrance is quite narrow, just as it is at Ringsön. It then opens up to nicely sized harbour. It’s great for all winds except for hard northerly. 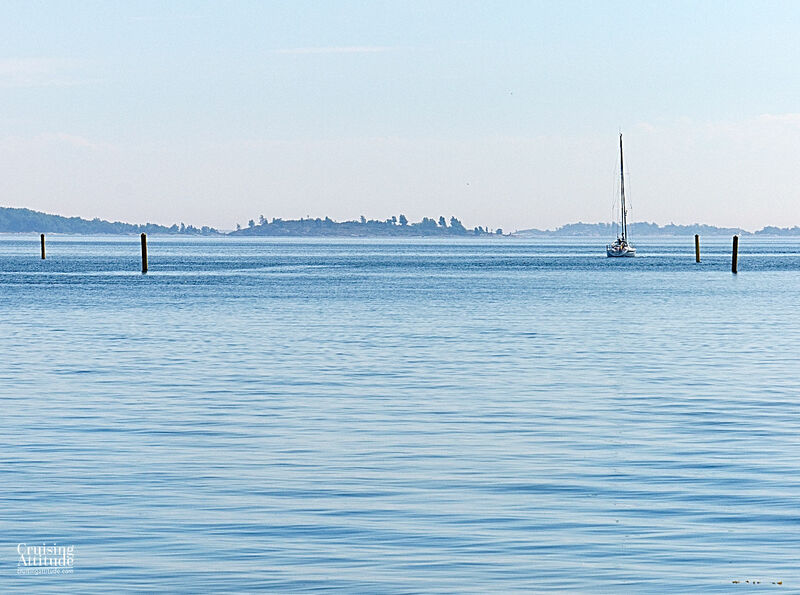 Just be careful not to anchor on the east side – there’s an underground cable there. Our Spade held on the first try, at about 10 meters’ depth. 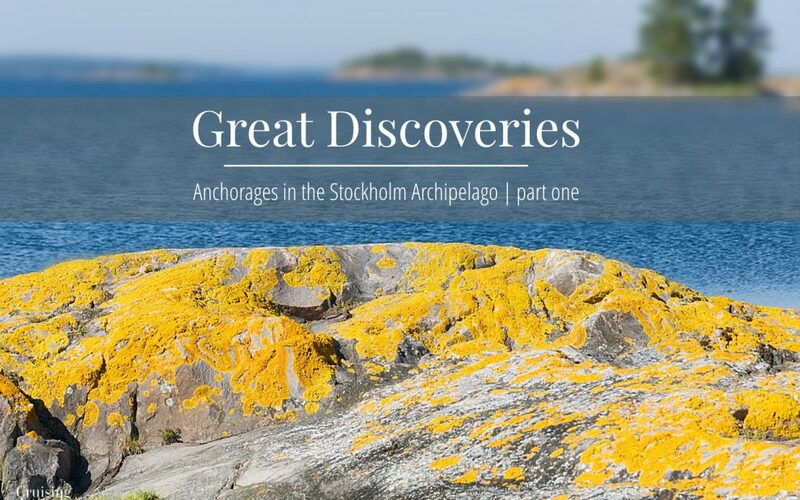 One helpful tip — avoid the urge to explore the island of Ängsholmen on the east side of the anchorage. Cows are kept there and attract horse flies. If you’re bitten by a horse fly you certainly know it! Ouch. 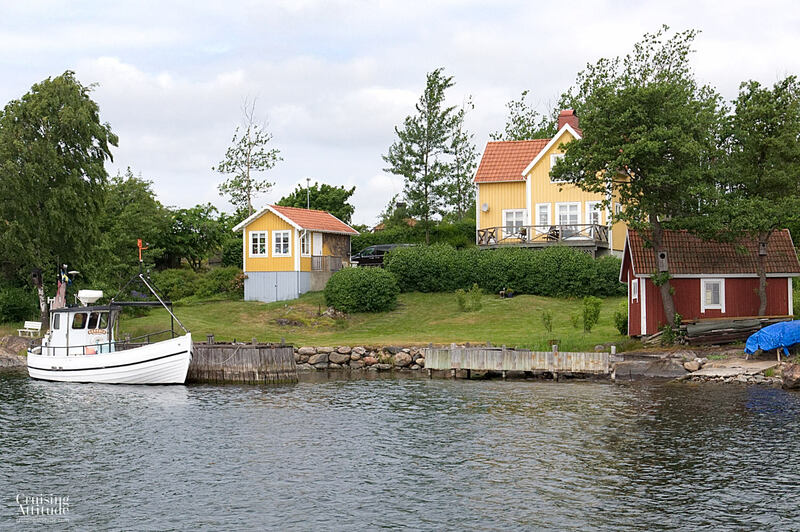 The route north from Rånö to Mörkviken on the island of Fjärdlång takes you past the wonderful marina of Utö. You can read about it in this post. 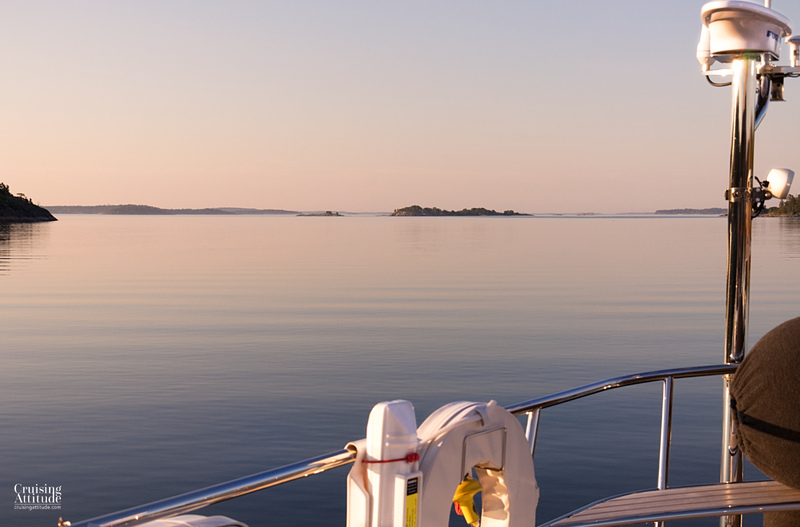 The views are just incredible in the archipelago! 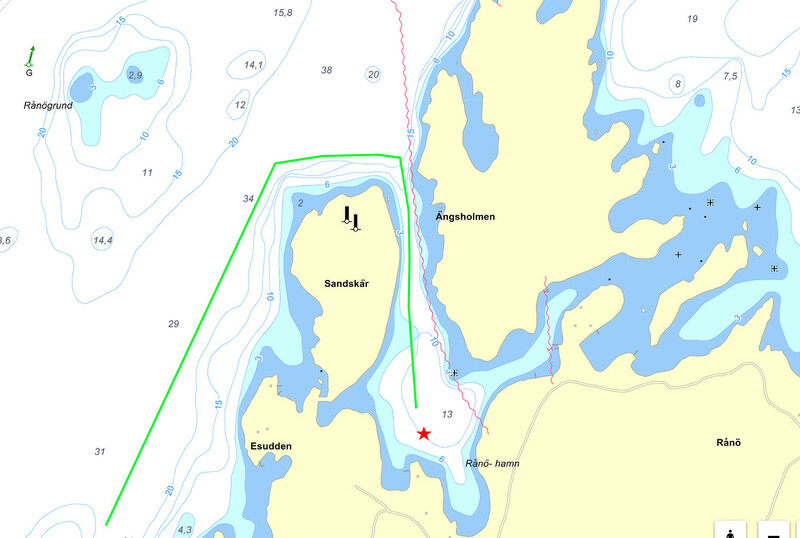 Mörkviken turned out to be perhaps a favourite anchorage in the Stockholm archipelago. 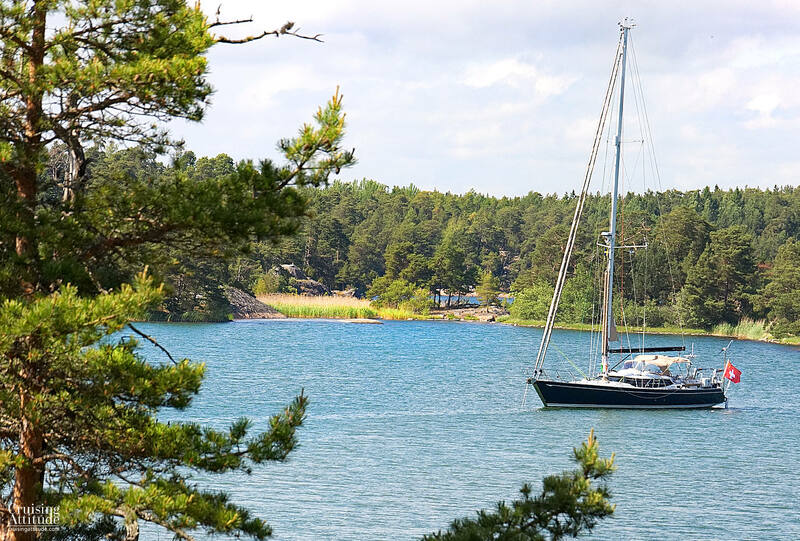 There are actually two parts to this anchorage — a small inner harbour which is perfect if you want to anchor up the “Swedish way” (two lines ashore with a stern anchor), and a much larger outer harbour – perfect for dropping your anchor off the bow. That wonderful moment after the anchor is dug in, you’ve filled in your log book and you’ve gotten the dinghy in the water. Jacques takes Senna out while I wait onboard to really make sure the anchor isn’t moving anywhere. We usually wait an hour before leaving the boat unattended. If you chose the inner harbour, you need to hug the western cliff face quite closely to get past the two underwater rocks. We noticed that most of the to-land/stern-anchored boats were using the finger-shaped out-cropping on the southern edge of the anchorage. We chose the outer harbour. We had winds from the southwest, and the forecast for the next couple of days was for weak winds from the S to SW. As you can see from the chart, the outer harbour would not be good in winds from the N to NE. 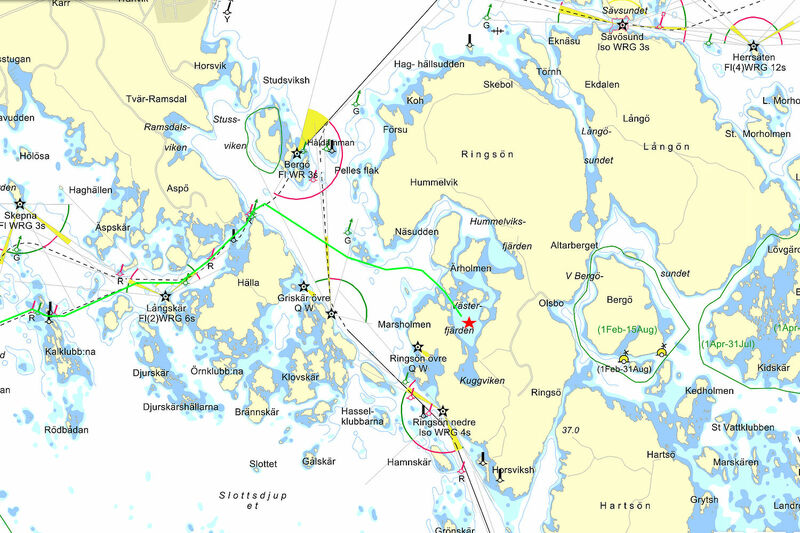 The anchorage of Mörkviken – here you see the inner and outer parts of the harbour. GPS coordinates: 59°03’3N, 18°31’21E. Our anchor held on the second try, in about 12 meters’ depth. It was now time to get Senna into the dinghy and take her to one of the islands to take care of her “needs”. Afterwards, it’s time for a swim. 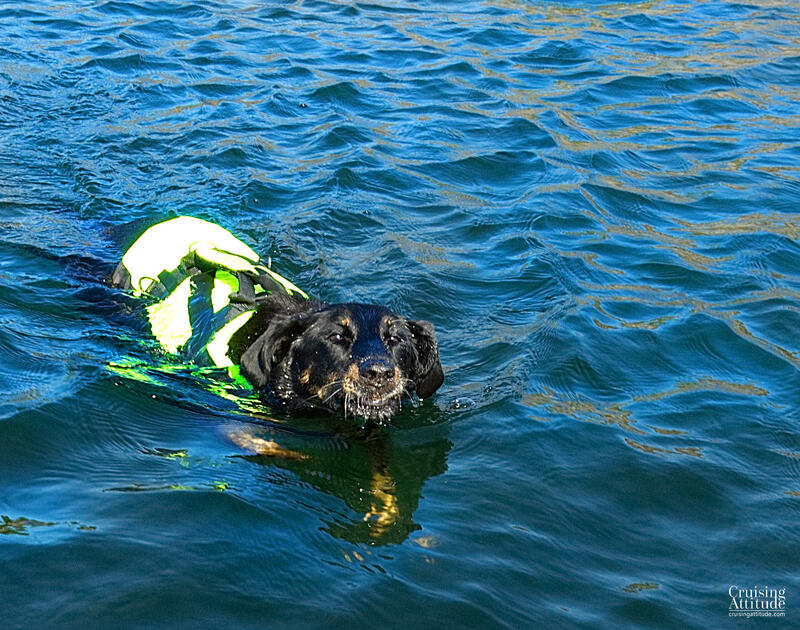 She loves to swim and we’ve started to follow alongside in the dinghy. It’s great exercise and the low salt content in the Baltic waters doesn’t leave her sticky and crusted with salt. It was midsummer — the weekend following the summer solstice — and everyone was celebrating with BBQs, herring and potatoes, music and lot’s of drinking. We ended up staying here for three days — it’s just that lovely. 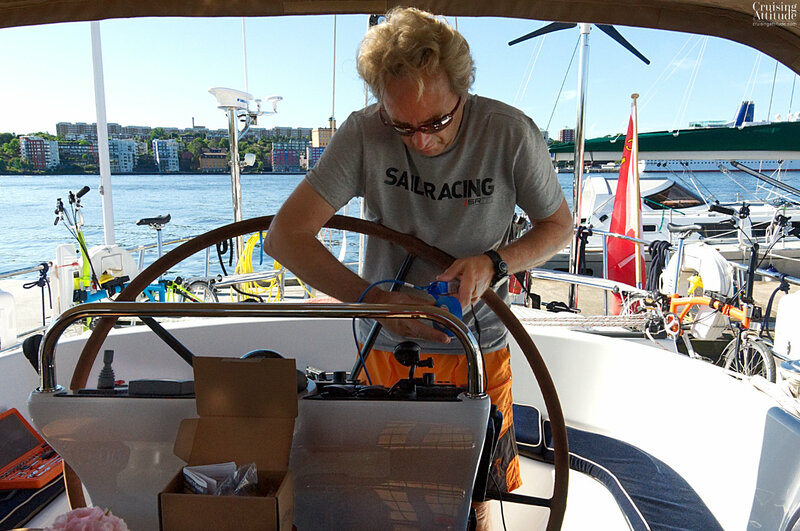 We worked on boat maintenance (mostly cleaning and polishing) had a few short swims and explored the anchorage by dinghy during long sunny days of midsummer. It’s not always sunny and warm during mid-summer, but in 2016 it was! View towards the entrance of the anchorage. Our boat Freja is on the left. The beautiful midsummer light at about 10.30 in the evening.